Forum Index > Off-topic Talk > Kukries at Kult of Athena. Posted: Thu 23 Apr, 2015 7:57 pm Post subject: Kukries at Kult of Athena. Just bought another Kukri I just saw on the KoA site, and I couldn't resist buying it. ( The perfect Walking dead Zombie medium length blade ...... ). The first Kukri I bought I just received in the mail today and the quality of the steel seems very good, the edge was very sharp out of the box and two quick passes with a Spyderco Tri-Angle Sharpmaker made the edge literally hair popping sharp. 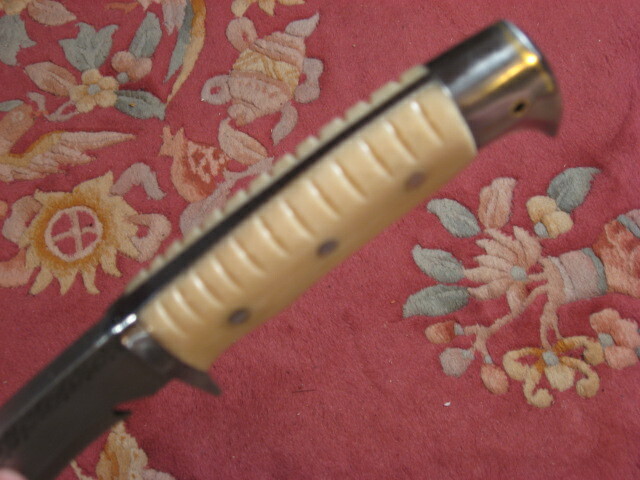 The bone handle is attractive on the tapering tang. The scabbard gives the blade a nice snug fit so that the Kukri doesn't fall out but is still easy enough to withdraw from the scabbard. There is a good forward balance for good chopping even with the 9 7/8" blade that is of medium length for a Kukri. 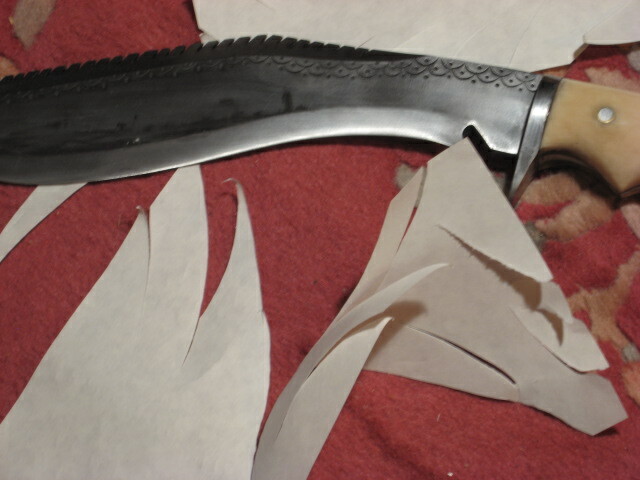 Since the back is supposed to be softer on most of these Kukri I'm not sure if the tooted back is as hard as the edge. 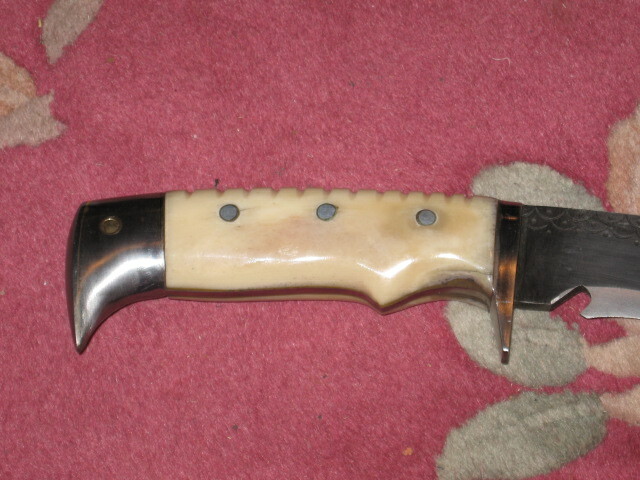 One small issue is that the bone handle feels a bit slippery but after I applied a bit of renaissance wax it made the handle just a bit tacky and less slippery. 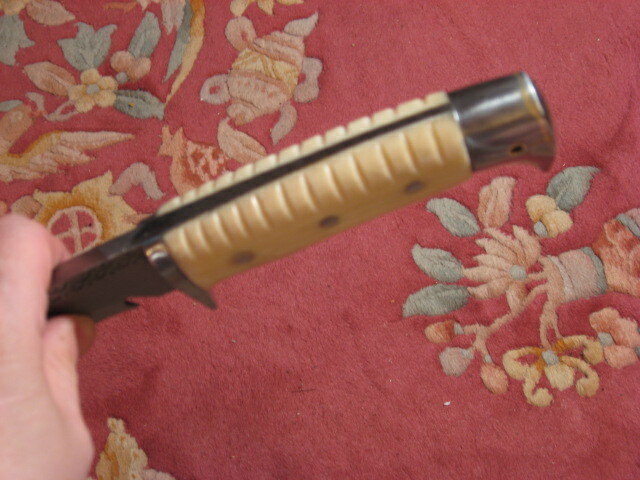 I might be tempted to do some filework on the top sides of the handle scales to give the grip a little more " grip ". 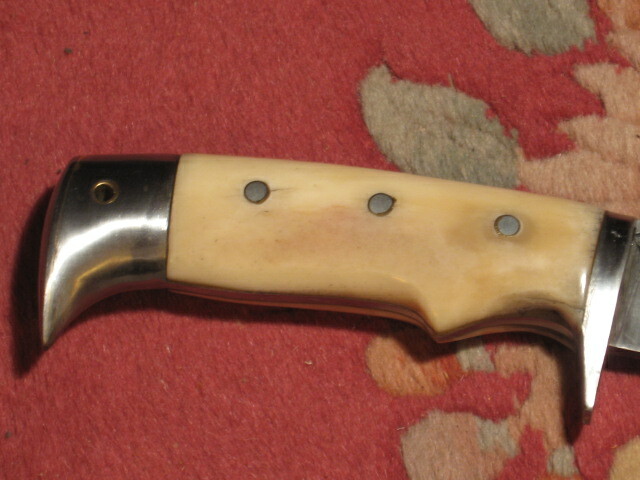 One could also add some sort of friction tape to the handle for a more secure grip, but the bone handle is very attractive and it would be a shame to hide it: Put some friction tape for use and remove and clean the handle when for display, maybe ? I think that this Kukri would make a very good camp knife in my opinion. As usual shipping from KoA was quick and problem free. Nice Kukris, give us your thoughts when the other one arrives. I really like the looks of that Cheetlange, although the American Eagle is quite handsome also. Thanks for the review, have fun chopping. I could definitely go for a Cheetlange. 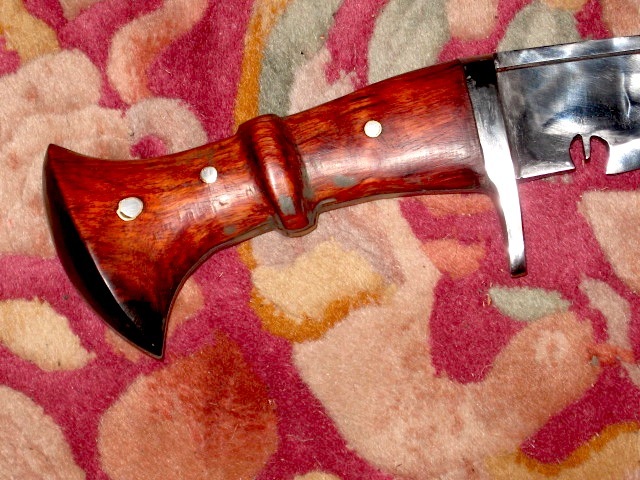 I don't know what happened to my kukri several years ago, it got lost in a move I guess. It was not near as nice as these... I should spoil myself, don't you think? 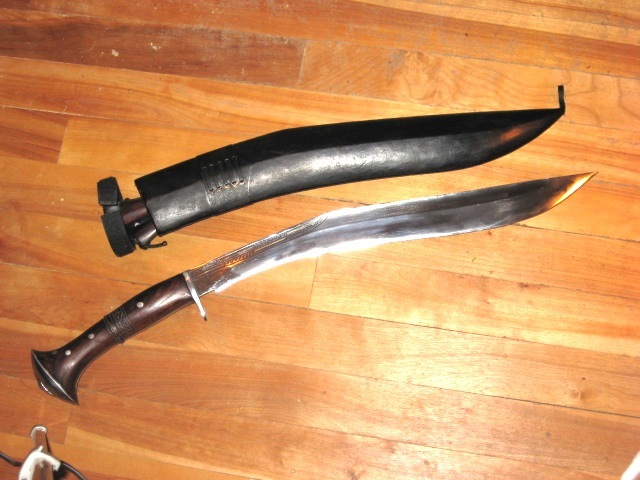 I realized that the Cheetlange kukri also includes a pair of stilettos (Sort of, and not mentioned in the description). They're mentioned in the last paragraph. 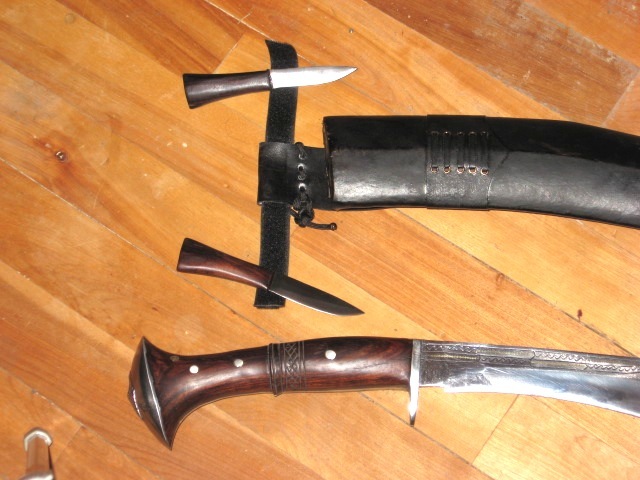 One (karda) is a utility knife, and the other (chakmak) is a sharpening steel (like a butcher's steel) and flint-striker for fire-lighting (which is why a tinder-pouch is common on kukri scabbards). 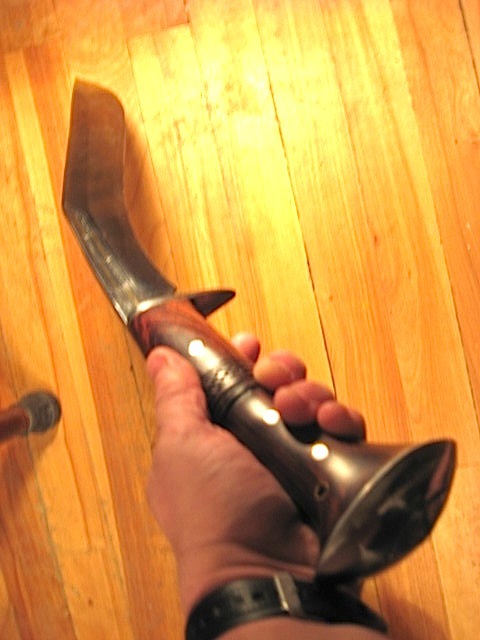 A little more about the Kukri, the guard looks like it may be forged integral with the blade. maybe drop forged as a unit or welded in some way to the blade ? In any case no visible gap between the guard and the blade. The pommel has a very faint liner suggesting that it's a separate piece, it also looks as if it might be a hollow pommel as the back/rear of the pommel looks as if it is soldered on. But in any case everything looks rock solid. Since the slippery horn handle was bothering me a bit I did some file work to make the handle a bit grippier, and I also think it looks good. Since this is a modern interpretation of a Kukri, and not styled strictly like a traditional Kukri, I didn't have to even consider any issues about a little DIY modification. 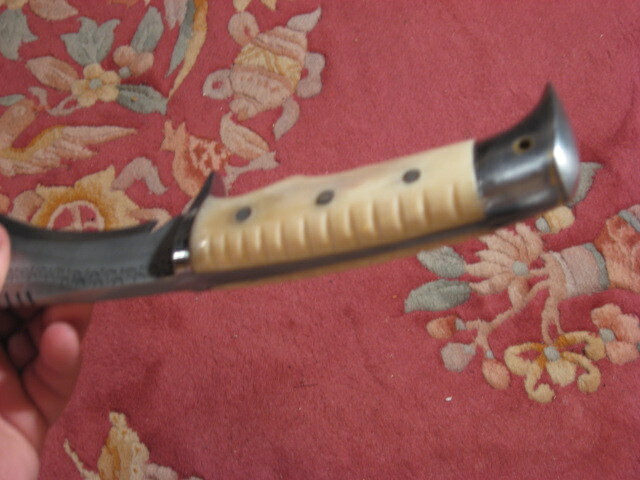 So, some pics of the Kukri as received and pics of it after the filework on the handle. NOTE: Small correction the blade is 10 1/4" long with mine, maybe they vary slightly in dimensions since these seem to be hand made. 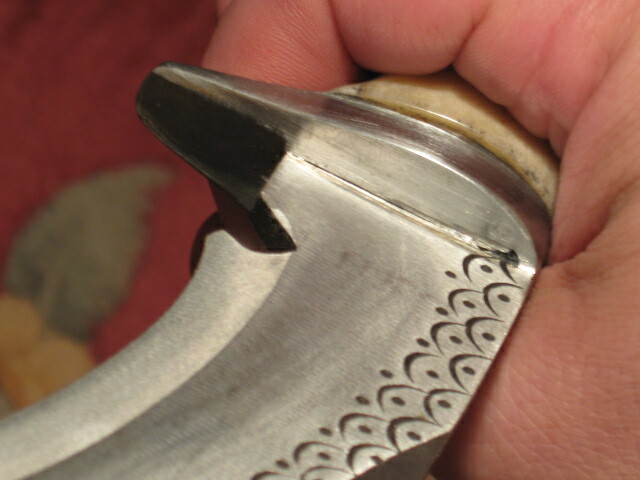 Guard looks as integral with the blade at the top. Again seems integral, but if it isn't there is zero visible gap. A little bit of paper cutting. Closer look at the cut paper. After file work on handle on the top side. More pics of the file work from different angles, in the last pic in the post above they are hard to see because they are mostly on the top side. I like the aesthetics of the 5 fullers, and this one should really be very axe like in use. I'll soon post pics of the longest one I already have, and of the new one on the way when I get it. Very heavy. My antiques of about the same length vary from 550g to 800g. You should pick up one or more of the late 19th century antique ones that Atlanta Cutlery sells. See whether you prefer the old style ones or the new style ones. 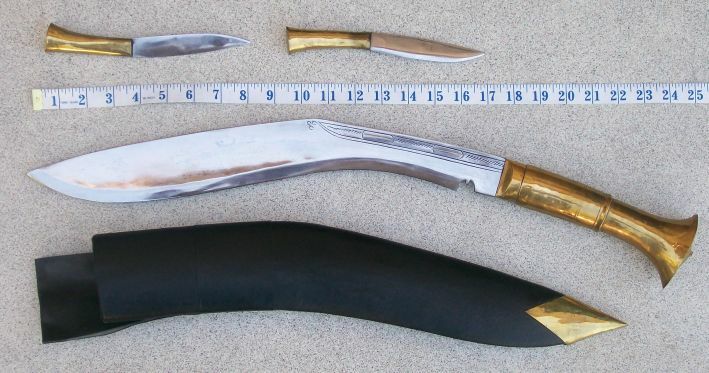 Yes, I agree it's very heavy for it's size, and traditional ones might on average be much lighter and more agile, but I sort of like " Extremes " and a Kukri this heavy might have some useful attributes like being a good small axe substitute. The first one I bought is much lighter and I am interested in handling both in a side by side comparison. ( And why buy two of similar weights when one can experience the handling of a much heavier version ..... I guess part of the fun of collecting for me is in handling very contrasting designs .... ). I'm not really much into collecting original antiques as I only have a couple of pieces that might qualify like an original persian Shamshir I purchased in the early 1970s. Specifically some of their " Tactical Knives " are not based on the Kukri at all, but I do find some of them interesting. Note KoA currently doesn't stock all of the EGKH product line, but maybe they will custom order if some people are interested in them. Ordering directly from the maker may also be an option, but I sort of like dealing with a vendor that I have had a long history of good customer service with. Now, for people living in other parts of the World, closer to Nepal than to North America, ordering directly from the maker might be a good option. Oh, and thanks Timo for the suggestion, certainly handling a historical Kukri and comparing it to a modern version could be educational. My heaviest kukri is about an ounce lighter than this 5-chirra kukri. It's an overweight brute, and too heavy IMO for practical use for everyday utility tasks or for fighting. It's intended as a sacrificial kukri, and it should do that job well. Grip will work two-handed, except for the large handed. I'd find the 5-chirra one too heavy for utility work. It's heavier than I like one-handed axes to be, even short heavy ones. 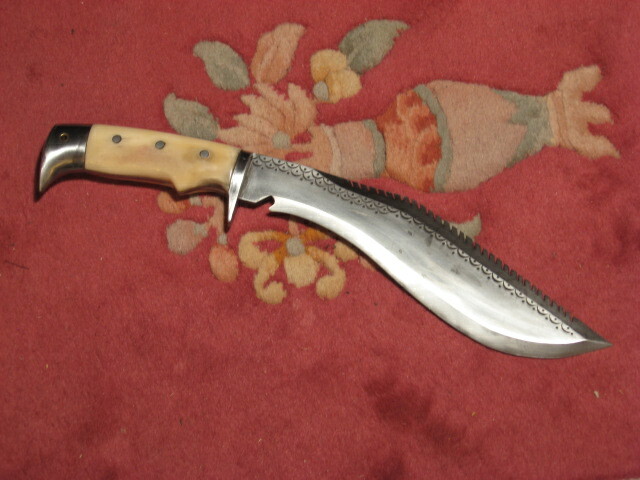 But I think you'll like it as an extreme kukri, anyway. Yes, a lot of the modern makers make some modern styles. Some of them are nice, potentially nice modern updates to the traditional design. Well, I received the 5-chirra Kukri and I agree that for everyday use it would be very heavy and it's really more of an axe than a knife. The weight could be manageable except for the fact that they made the grip VERY VERY VERY over-fat in diameter: I can easily handle the weight but not combined with a grip I can barely close my hand around. Now the bigger blade and thicker blade stock would be O.K. if the scale of the handle was kept identicall to a normal sized Kukri ??? 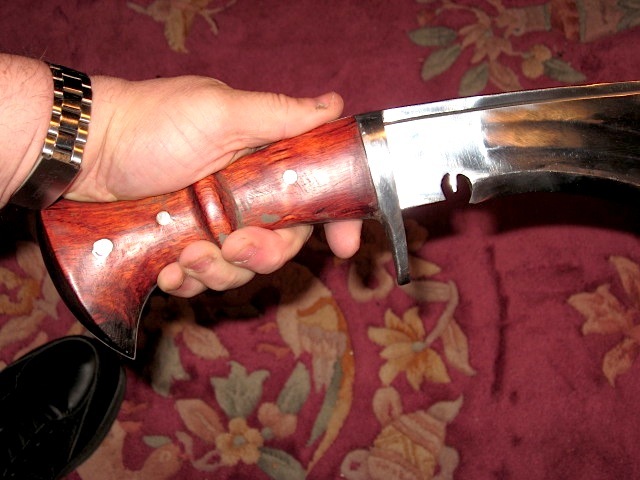 So, I'm going to take the belt grinder to the handle and hand tools and I'm going to reduce the diameter of this Kukri to a reasonable diameter: So, I can't recommend this one, unless for display purposes to anyone not having the tools and skills to make it a DIY project. 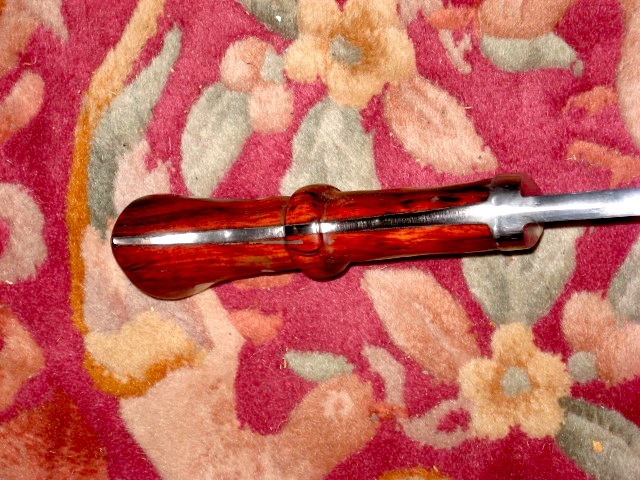 I will make a new post with pics after I do the modifications to the handle dimensions, and then give it a more complete review. I do like the look of it, and it's " A BEAST ". 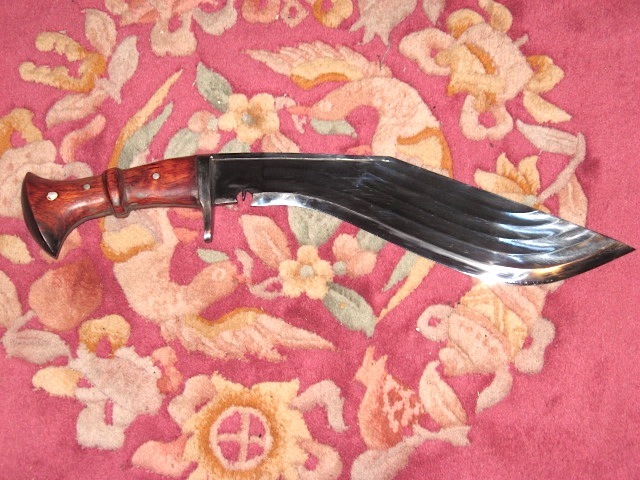 The long Kukri I bought previously ( Cheetlange Blocker Khukuri - 18'' Blade ) also has the slightly too fat handle, but not to the extreme of the 5-chirre one, also the long one with the 18" blade isn't too heavy at 2 lb. 4.7oz. 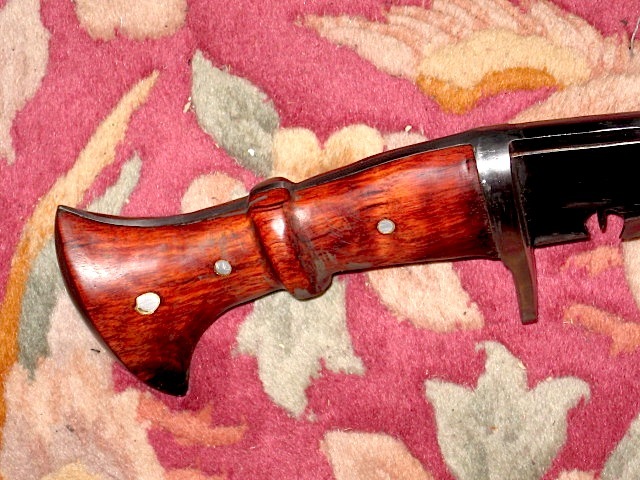 I might reduce the diameter of the handle of that one also, but only on the front part of the grip as the rear section near the pommel feels O.K. in the hand. So in summary the main and only design flaws I see with these is in making handles fatter on some of them: If the blade is bigger and/or longer it makes no ergonomic sense to make handle fatter since the human hand handling the knife is the same size. Now making handles longer can make sense, but not diameter. 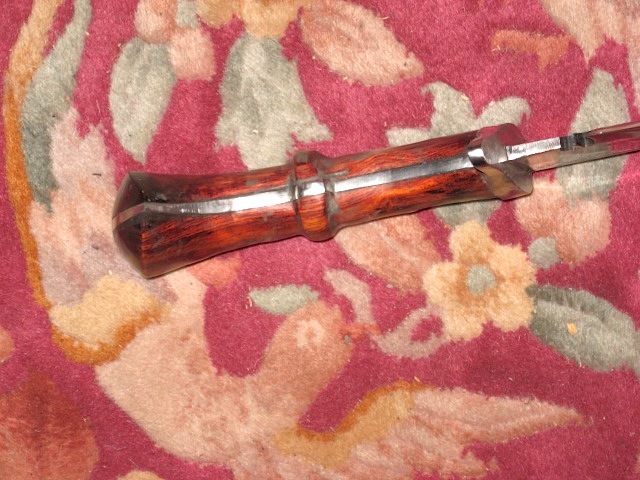 I really like this one, and the handle is only too fat in the front section of the handle by a small easily fixed amount with files and sand paper, but if one has a very big hand it might work as received. If held on the rear section of the handle it feels comfortable and the flared handle and pommel helps a great deal in retaining the knife and very comfortable. One other issue is that the scabbard only holds the blade by gravity as it is fairly loose, this can be explained because with a blade that is wider near the tip than it is near the guard it is challenging trying to make a scabbard have a firm hold on the blade. Now if the sides are close enough they might apply some friction to help in keeping the blade in the scabbard better ? I fixed this small problem with self adhesive velcro strips to use as a safety strap. This Kukri might be good as a heavier than a machete substitute but it really is more a short sword than knife. 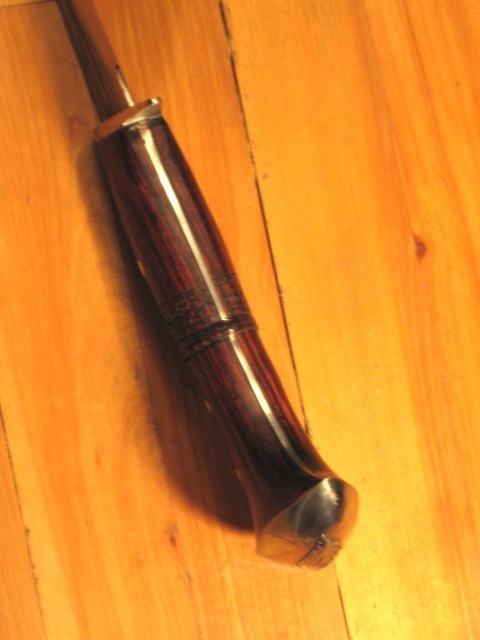 The tang is tapered towards the pommel but also tapered from the back side to the edge side. 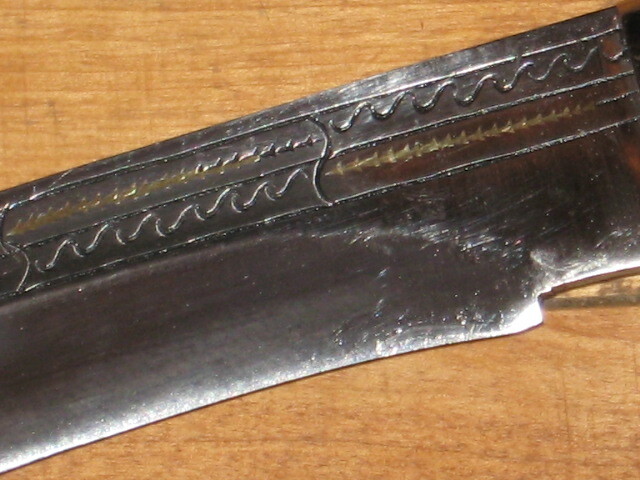 After seeing 3 of these Kukris I think that the guards are separate pieces but they also seem to be welded where they meet the back of the blade and then ground so that they look like one piece of steel ? I don't know for sure how they do this but maybe some sort of spot welding. The fuller looks really good and so does the engraved or etched lines on the blade with copper inlays. The point on this one has a very subtle recurve just at the tip for maybe 1" Now this may vary from piece to piece as these Kukris seem to have a lot hand work and forging involved so no two of them would be 100% identical. 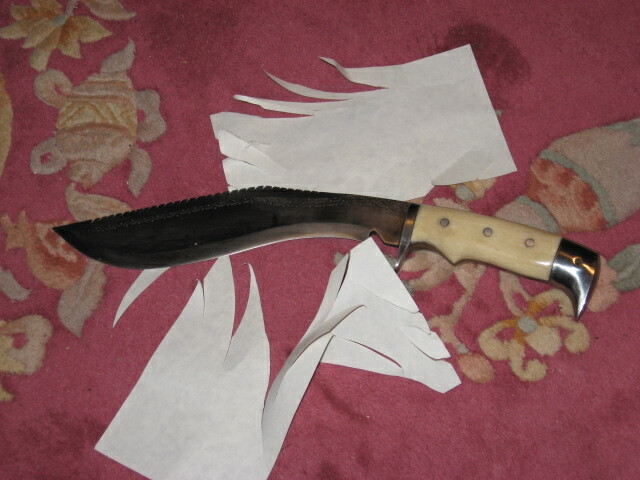 The blade came paper cutting sharp and just a few passes with a diamond hone to make it arm hair cutting sharp. Handling seems good, but hard to tell without knowing the martial art of using a Kukri: Parrying would be " interesting " with the shape of this blade. 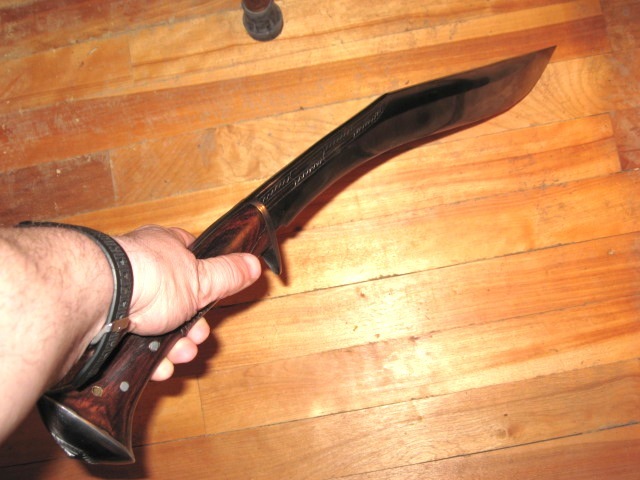 I'm just guessing, but I might use the back or flat of the blade to parry when possible as the blade might tend to want to rotate in the hand in a way that a reverse " slap " with the back of the Kukri would work ? 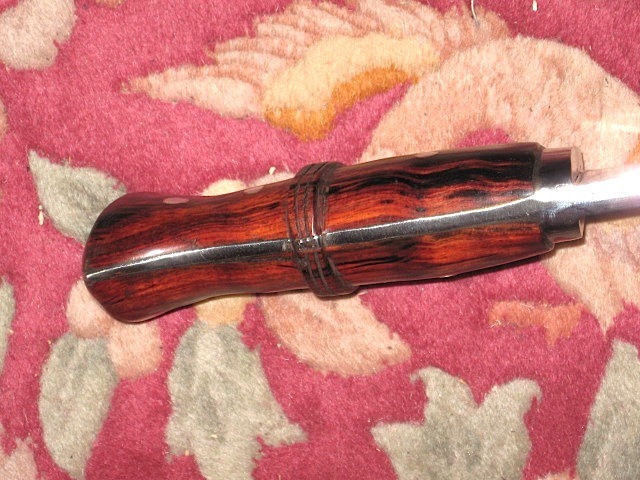 The rosewood handle looks well fitted and with an attractive grain. Showing the velcro safety strap I added with little difficulty. The engraved/etched lines look better than in my pic. Back of thang where one can see the taper. 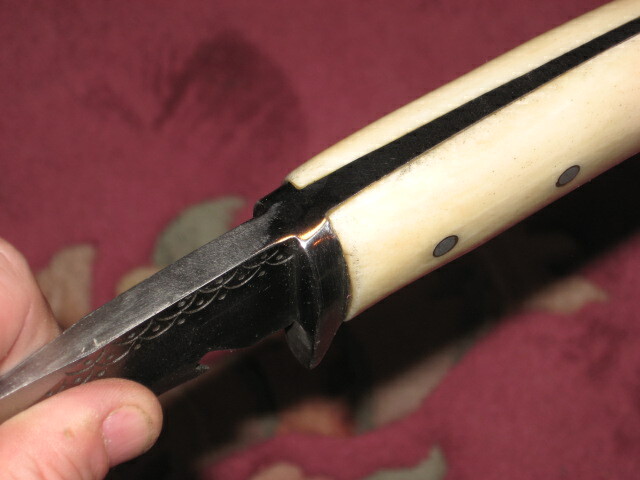 Joint of quard and blade seems welded, or spot welded, but just on the back .... not welded completely around the blade. 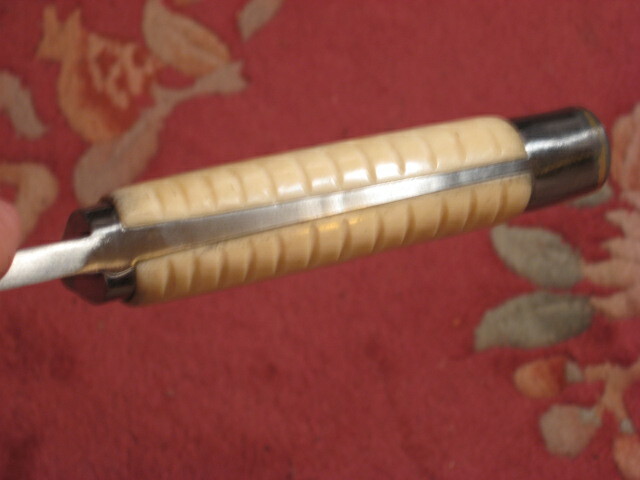 tapering tang thinner on the finger side of the handle. A few more picks of the Kukri in hand, the angles do distort the appearance of the length of the blade but they do show that the handle does feel good when held on the rear part of the handle. ( Look at the pics at Kult of Athena for more and better quality pics ). The front part of the handle just feels to me to be too fat by 5% to 10% max. 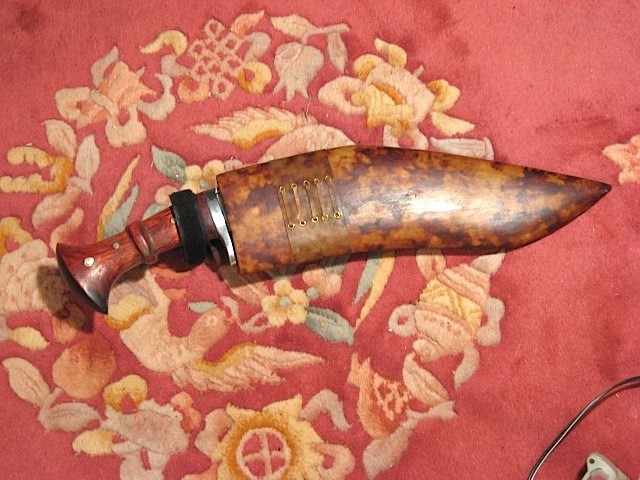 ..... so not really bad, but just shaving a bit of wood on the sides should all that I need to do to make the handle feel good in my hand. Oh, the grip is long enough for a two handed grips if using it chopping up a small tree or big branch ....... the blade is too short to use with any Longsword techniques but I guess one could use two hands on the handle to parry a spear or a halberd when closing distance into measure ? So I just modified the very heavy multi-fullered Kukri. As modified it's still an extremely heavy Kukri, but at least I can hold on to it, or use it without my hand cramping up. I slimmed down the very fat handle of the multi-fullered Kukri down to a comfortable holding diameter. Now the handle feels much better in the hand, and the smaller size of handle is aesthetically more attractive in proportion to the blade in my opinion. I also re-profiled the tang to a bit narrower with a belt grinder, and I slimmed the thickness down more than I did the width of the handle. Even after modification I wouldn't recommend this one for actual carry, but it is still an interesting collecting piece. 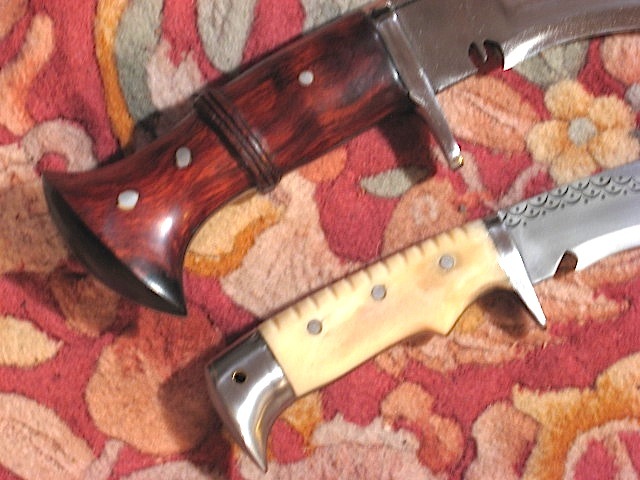 The long Kukri I bough is more weildy and the smaller sawtoothed one would actually be a reasonable field carry knife. 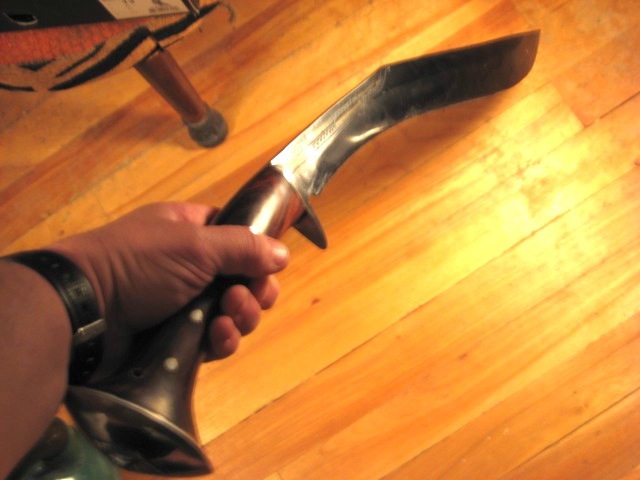 The fat handled monster heavy Kukri before I slimmed down the handle. 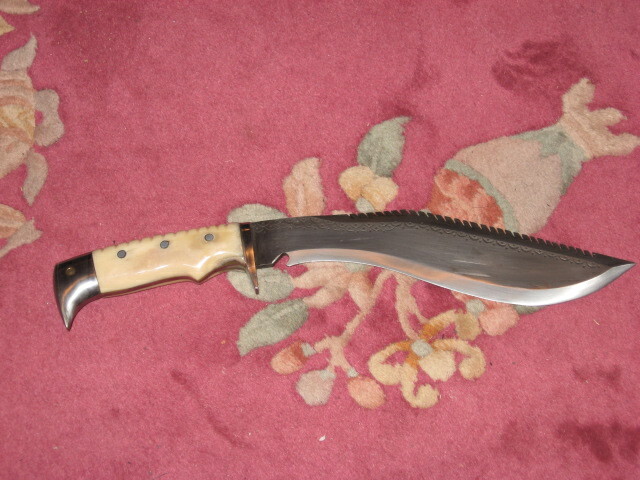 The modern Kukri with saw toothed back. Vietnam War commando/survival knife ). 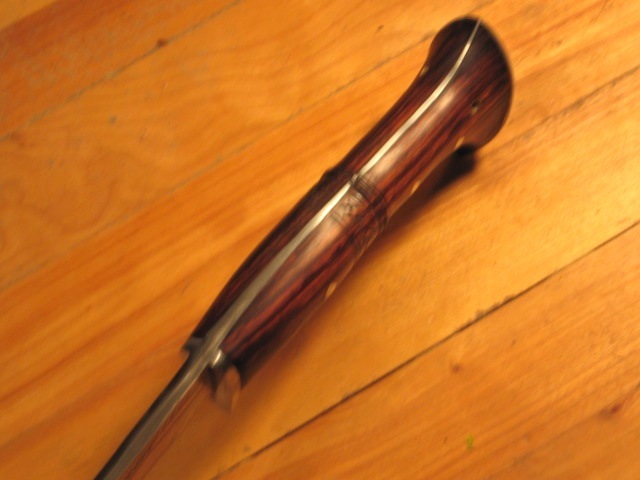 Top view of fat handle. Slimmed dow handle side view. Angled pic of the slimmed handle. Edge side of slimmed down handle. Handle to blade new proportions. 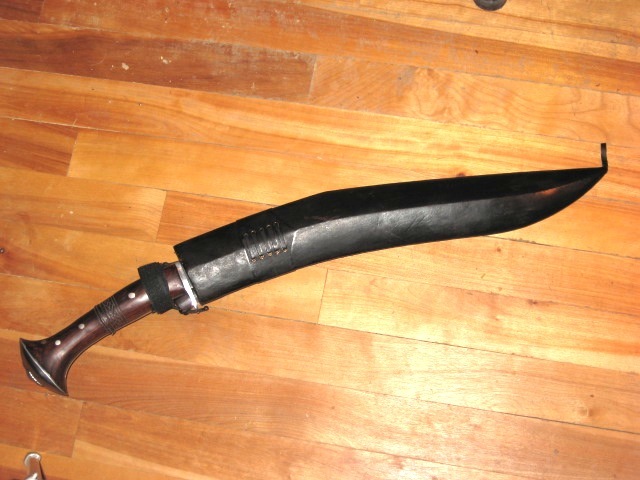 Oh, the scabbard on this Kukri is of water buffalo hide and although the leather is thin it's extremely strong and the belt loop feels more like a steel spring when trying to bend it. Basically it has the feel of raw hide as opposed to a supple leather. Oh, a couple more pic of the Kukri in hand, one with my hand closed on the handle and the other one I'm holding with a more open grip just to show the handle better. Note I added a velcro safety strap to this one also otherwise the Kukri could fall out if the scabbard was reversed or if one took a header. 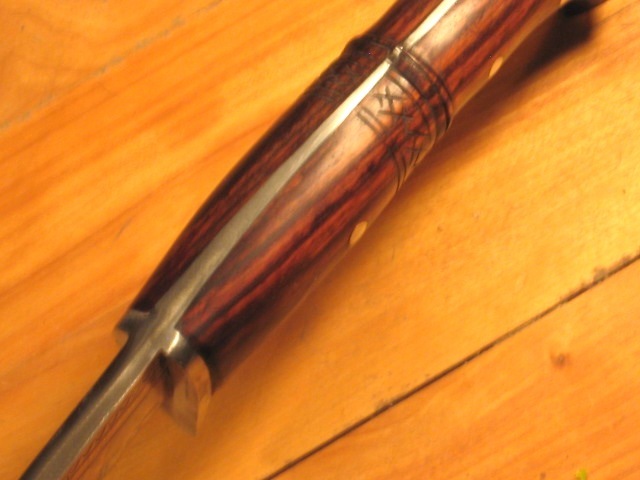 Modified handle and in the scabbard. 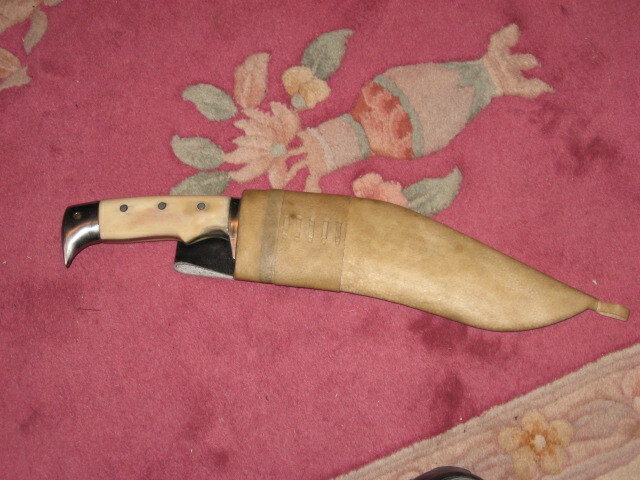 Kikri with hand closed around it. Hand semi closed to show handle better. 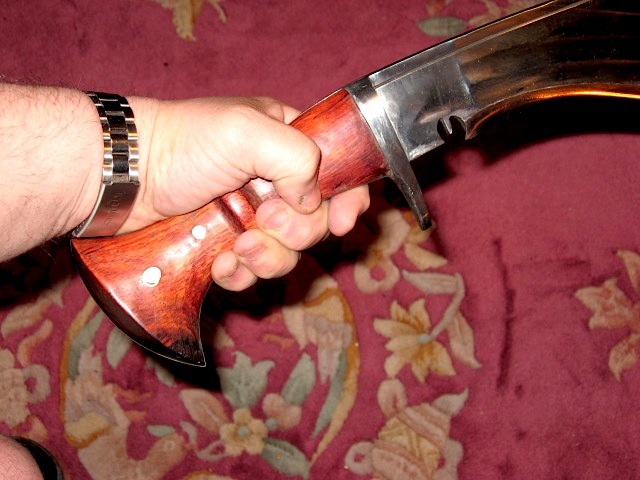 Even after reprofiling the handle on that heavy kukri looks huge in your hand. Is it usable and comfortable now? Because the cross section is like a much narrower rectangle with rounded corners the grip is now comfortable and usable. I could in theory make the grip a little narrower but if I made it too small my grip might not feel too secure. The blade weight is still very excessive and if the blade has some distal taper it would handle much less like an axe and more like a knife. If I closed my eyes I could easily believe that I was holding a fairly heavy axe ! You certainly did a nice job of reshaping the grip, I don't think anybody would know it was different unless they had a stock kukri for comparison. So which of your kukris are you going to take with you when you go zombie hunting? I've been considering buying this one to see if it works well as a hiking/camping/foraging tool. Does anybody have any experience with this kurkri as a tool? Yes, that looks like a good practical choice, and it would be fairly easy to slim down the handle should it be too thick ? 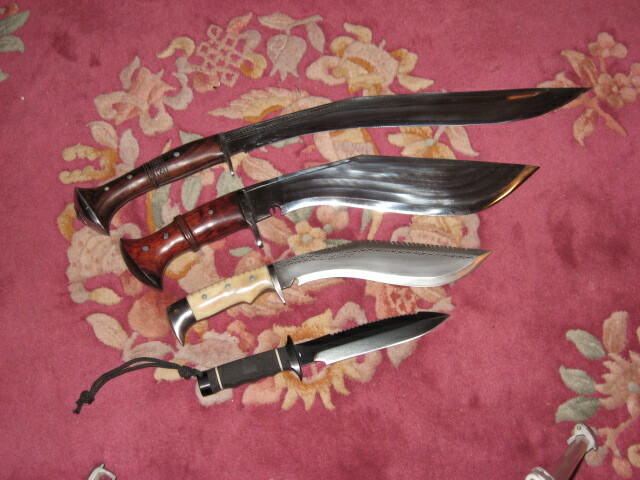 As to the Zombie Kukri preference, I would probably take the long 18" bladed one and maybe the smaller one in addition. A lot would depend on being on foot or using a vehicle where one could have a lot of extra spare weapons. I think a sturdy low maintenance cross-country bicycle would be a good choice in the " Walking Dead " scenario of the T.V. version of slow Zombies. ( With some sort of saddle bags one could carry more guns and ammo ..... and extra " choppy/cutty things " ). A nice quiet bike would be a good way to sneak around and still be fast enough to get away from slow Zombie Herds.